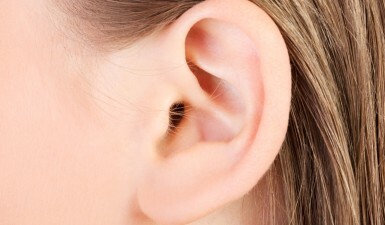 ossicles, three small bones that are connected and transmit sound waves to the inner ear. These bones are called malleus, incus, and stapes. the eustachian tube, a canal that links the middle ear with the throat area. 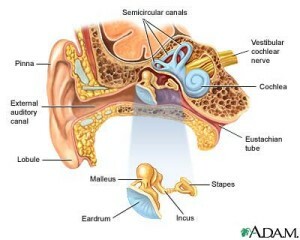 The eustachian tube helps to equalize pressure between the middle ear and the air around you. Equal pressure is necessary for the proper transfer of sound waves. The eustachian tube is lined with mucous membrane, just like the inside of the nose and throat. The outer ear is where hearing starts. When a sound is produced, the sound waves, or vibrations, travel down the external auditory canal and strike the eardrum (tympanic membrane). The eardrum vibrates. The vibrations are then passed to three tiny bones in the middle ear called the ossicles. The ossicles amplify the sound and send the sound waves to the inner ear and into the cochlea. When sound waves reach the inner ear, they are converted into electrical impulses that the auditory nerve sends to the brain. These electrical impulses are then translated by the brain into sound.